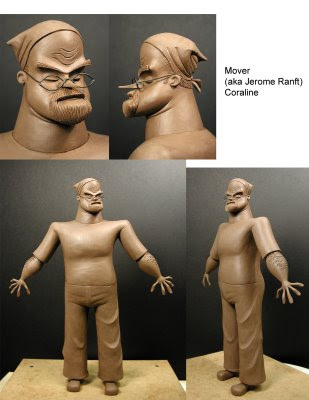 With Coraline coming out today, Damon Bard has put up loads of pictures of all his Maquettes he did for the film. 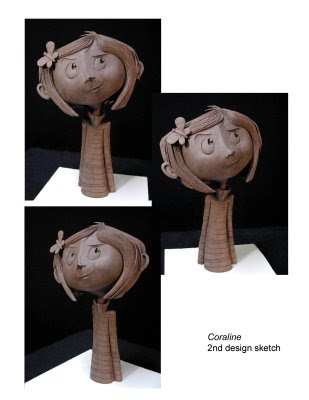 I was able to ask Damon a few questions about his work on Coraline (see below the pics). To view more of Damons work, go to his website at http://www.bardsculpturestudio.com. Damon how many sculptures did you do for Coraline? I did quite a few sculptures for the film. I don't remember how many, but a big chunk of it is on my site, it was alot though. I was involved with the project for about 3 years on and off. The delicate shapes in those characters are amazing. Was it a challenge creating some of the sculptures? Part of the challenge is the delicate shapes. Also, getting in tune with Henry Selick (or any director) can be challenging as he is very demanding when it comes to what he wants. Another challenge is the engineering of the sculptures for the puppet fabrication, making them functional for the animators to animate, and easy to maintain and replace parts that blow out during shooting. Basically, every character in a stop-motion film has its own unique set of problem solving challenges that need to be met in order to make a functional puppet. And all that is just with the characters, the sets and environments are a whole other animal. They also require demanding creative approaches that will impact the puppets once they get on stage. The biggest challenge in a film of this magnitude, with so many physical objects being made that have to work together, with literally tens of thousands of engineered parts, is that it all has to be planned out to go as smoothly as it can go. That as a whole is a tremendous challenge for every department, and everyone has to work together. Personally, I love that kind of a challenge. Stop-motion films are one of my most favorite types of projects to work on and it's fun to have to figure it all out. 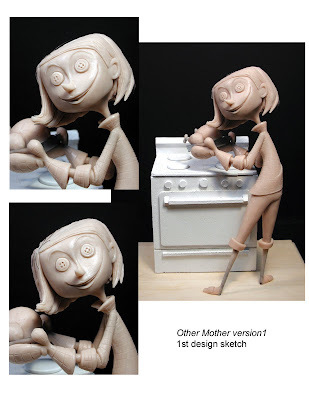 Is this your first time stop motion animated film? No. I have worked with Henry on many things since James and the Giant Peach and on various television commercials that require stop-motion puppets. It is a very comfortable medium for me to work in. Did you approach your work any differently because of it being stop motion? Yes, as I mentioned above stop-motion puppets require a huge amount of work, time, and planning to come to fruition. The sculpting process is the same but the foundation of the character/puppet building process is the maquette, that is the beginning. You have to know how the puppet will work once it is finished, even before it has been made. After that, a puppet sculpt is done based on the maquette and is engineered so it can function properly as a puppet and pave the way for the rest of puppet fabrication processes. It's like working in the present and in the future at the same time. The way I approach it deviates almost immediately from the start. Damon, what do they do with all your sculptures once the film is done?